When you own a home, you technically own two homes. You own the structure, but you also own a stake in planet Earth, a tiny niche of our planet. With that ownership comes responsibility, and many new home designers and owners are rediscovering that. Modern sustainable home design is eco-friendly without compromises. It incorporates technology, design, and engineering into a fascinating combination that produces beautiful homes. Here are just a few tricks of the trade. As sustainability has become more important, industry professionals have designed certifications to standardize what “sustainable” means. The most popular is the Leadership in Energy and Environmental Design (LEED) certification, which signifies efficient water and energy use. Not only do they help the planet, but LEED buildings save their owners money. The WELL certification takes a different tack. Through creative, thoughtful design and careful planning, WELL-certified buildings are built around the mental health and well-being of occupants. Recycling is amazing technology, and its use in homes is no less miraculous. Reclaimed and recycled materials can produce amazing new structural materials. Many of these – such as recycled composite decking – are not only cost-effective, but extremely durable. Reclaimed wood is especially popular for furniture. The unique nature of some disused materials can give these pieces an artful quality that makes them ideal room centerpieces. Anyone who’s ever been to a strip mall would agree: modern architecture can often feel…lifeless. It can stand against nature, rather than alongside it. Biophilic design philosophy seeks to change that by more closely integrating natural and man-made structures. Based around the writings of Edward O. Wilson, biophilic design asserts that humans have a natural desire to reconnect with nature. In architecture this takes many forms. It can be as simple as tall windows on a forested lot, or as elaborate as a living wall. Do you dream of owning a custom home with the latest in sustainable technologies? 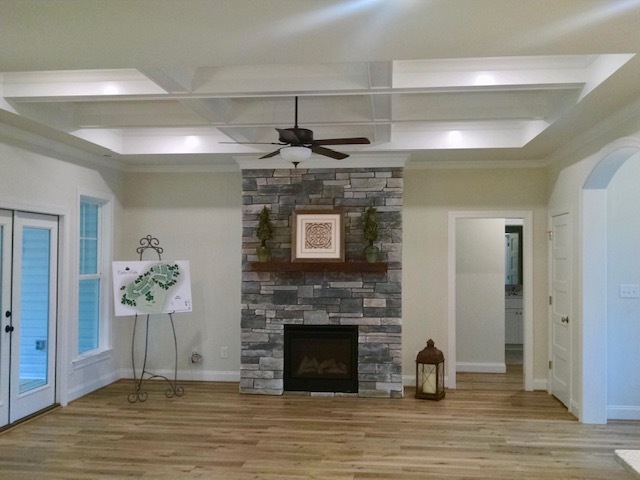 With over two decades of experience, Tingen Construction builds custom homes across North Carolina’s Triangle. You can view our available homes now, or contact us to make your custom home dream a reality!